I could totally go for some of this on top of vanilla ice cream for breakfast. I’d get the shivers for only a nibble. Brooke, should I tell you have a tub of KCS sitting in my fridge? No, I probably shouldn’t. That would be cruel. Oh my. I am imgining this with a little Scharffen Berger goodness. Jennifer, do you have a nanny cam in my kitchen or something? Because I used a happy blue bag of Scharffen Berger Bittersweet to make KCS. Did you say Theo chocolate Beth? I have my last bit of Theo (salted caramels) stashed away in the fridge. That is some seriously good chocolate. Now that you’ve planted the seed in my head, I may have to try and make a batch of KCS with some Theo Chili Spiced Chocolate. Did you find it locally or did you have to order it online? I like your style, Wendi. 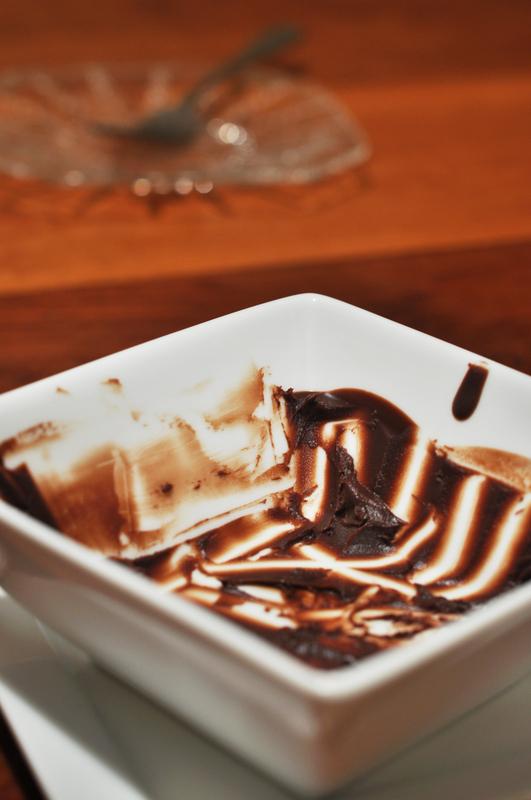 Eating melted chocolate or sauce straight from the bowl is one of life’s great pleasures. Between BAH and D4T, I think I’ve found my new religion. For you both shall never lead my palate astray. Ali, I can’t make promises about everything I post on BAH but I completely guarantee that you can not go wrong with Killer Chocolate Sauce. Hope you’ve been discovering all sorts of D4T happiness. Haha I love that clean bowl shot. Reminds me of my late night leftover Christmas cookie snacking I did last night! Elizabeth, sometimes the best food shots are the “after” photos. I make a version of this…and it’s one of the most deadly things in my arsenal. My hips…they know this all too well. Yum! Love that picture 🙂 I’ve seen this recipe in D4T, but hadn’t tried it yet. It’s quickly moving to the top of my list. Jen, this gem is quick, easy, and fantastic. I can’t recommend it enough. If you happen to have any leftover, it can be stashed in the fridge. It will harden but very easily reheats in the microwave or even sitting out at room temp for a bit.